This entry was posted in Great Britain, Weddings and tagged Countess of Snowdon, Countess of Ulster, Duchess of Gloucester, Lady Davina Lewis, Lady Rose Gilman, Lady Sarah Chatto. Bookmark the permalink. I didn’t mind Serena’s fascinator, especially with her short hair, but it just doesn’t have the wow factor I expected for this event. Lady Sarah, on the other hand, looked stunning in all dove grey, something I normally wouldn’t expect when dressing in only this color. 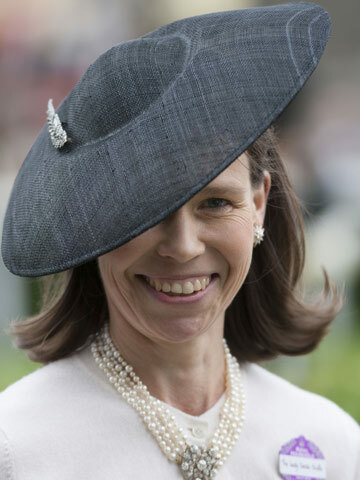 I also love Birgitte’s hat and was glad to see it at Ascot one year, but want to see if repeated more often. Davina and Rose were rather underwhelming, but luckily nothing was as bad as their sister-in-law’s wannabe headpiece; Claire, it’s so small and blends in with your hair! Bring back the fascinator you wore to Rose’s wedding! Serena- Sort of a space-age futuristic royal hat. It’s super cool and I love it. Sarah- I thought it was boring until I watched the video. A girl who puts diamonds on her hat gets 2 thumbs up from me. Duchess of Glouwhatever- OK. The hat’s great but the coat is 1980s BAD. Lady Grey Pinwheel- cute. Her dress needed something interesting and this does the trick. Lady Navy in Front Pink in the Back- LOVE. LOVE. LOVE. Love the shape. LOVE the unexpected hit of pink. LOVE. I agree with what Janae says:	April 30, 2015 at 1:05 pm, though I wish Serena’s hat was a bit larger. A lovely selection. I particularly like the Duchess’s more dramatic hat, a nice change for her. I think Serena’s hat would have been better if everything about it was about twenty per cent bigger. In contrast to the last post, there isn’t much more to say, really! I also love Brigitte’s hat. 2 tone hats don’t always look good but hers is lovely. I don’t usually like modern, abstract hats but there’s something about Serena’s hat that’s really beautiful. Sarah’s hat is also a perfect classic. All lovely. Lady Sarah is so graceful. Serena Linley looked wonderful and I don’t usually like little hat-type things stuck randomly on one’s head. But on her, it worked. Duchess of Gloucester wore a perfectly good hat with that dated looking dress. Those stand up ruffles must go! I can barely see The Countess of Ulster’s black hat, so have no opinion other than it blended in well with the back jacket photographed behind it. We have seen the Duchess of Gloucester’s dress many many times, usually with her little “gumnut cap” – so it is a treat to see her pair it with a new, proper hat! !